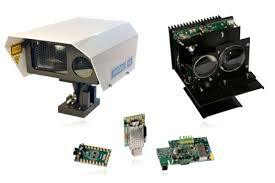 Trimble FSO offers a comprehensive range of laser link products capable of transmitting up to 1.25-Gbps full-duplex. Unlike wireless and microwave links, FSO links do not add additional overheads to packet transmission so Gigabit full-duplex throughput is achievable. GeoDesy products have an increased reliability when compared to standard laser link products via a number of technical innovations. These include the ability to install a backup wireless link for increased uptime, auto-focus lasers to compensate for bad weather, and an automatic adjustment system that continuously keeps the laser in an optimal position. Laser links can provide an excellent cost-effective alternative where full-duplex Gigabit is a must.